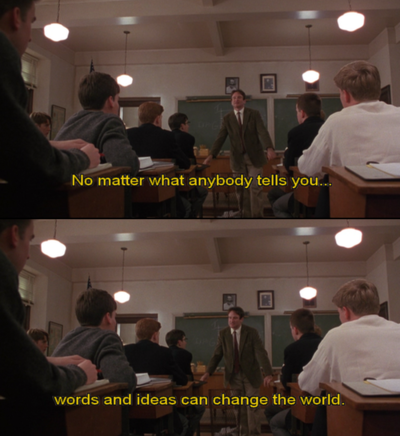 Dead Poets Society, along with Frida and Forrest Gump, is one of my favorite movies. Anne of Avonlea is one of my favorite books. The teacher that has been dearest to me in my life, the inspiring, vivacious, witty young soul who has the bravery to stand there for an hour and a half each day to talk about love, passion, words and ideals, to a group of uninsterested young things, was supposed to teach me for two years in a row; but she is pregnant (with twins) and so the classes I have left with her are few. I cry at least once every day, but that was a day in which I cried throughout the day. Motherhood and babies are wonderful things, but still, I cried. And all the intuition that I had in me that I want to teach grew into a sizable passion of I WANT TO TEACH, because of a single young woman who has delivered what she believes in with passion every day of her working life. Thank you, miss, for teaching us so much more than what is in the books. If I have the privilege in this life, to motivate one soul to pursue and learn and live, and I have the privilege of living thanks to that, I will. I might be scared, because of annoying and uncooperative children, because of routine, because of so many things. But I know this is right for me.